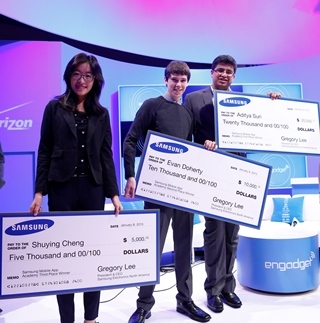 Aditya Suri, an 11th grade student at George Walton High School in Marietta, was chosen as National Grand Prize winner from Samsung App Academy and awarded a $20,000 scholarship at the 2015 International Consumer Electronics Show (CES) in Las Vegas. About 300 11th and 12th grade students had participated in the three-day learning and app development session. Samsung encourages students to pursue careers in app development, one of the most in-demand STEM-related occupations. Aditya’s Mobi Sense app facilitates communication for people with visual, vocal, or auditory impairments, aiding their integration into society. Its multiple functions allow customization to address specific needs.